Do you or your sleep partner struggle with chronic snoring or possible sleeping disorders like obstructive sleep apnoea? Breathing difficulties are sometimes linked with specific oral anatomy that cause a collapse of the upper airway, blocking off oxygen flow. During a sleep apnoea screening, Dr Anish Malesu (Dentist) will check things such as neck and tonsil size, medications being taken, the frequency of alcohol intake and specific facial anatomy that may all contribute to the condition. Some people also exhibit signs of flat, worn teeth if they have a sleeping disorder. This condition is due to clenching of the jaws together during periods of oxygen deprivation, causing the teeth to wear against one another over time. If you have obstructive sleep apnoea, wearing a special mouthpiece at night can help to naturally open your airway and improve your breathing. Sleep appliances also help with snoring. To get started, we’ll talk with your physician or pulmonologist to determine if you qualify for an oral sleep aid. A home or clinical sleep study may be needed. After taking an impression of your teeth, the mould of your mouth is used to create a special mouthpiece that positions your lower jaw in an advanced position, preventing the soft tissues near the back of your throat from sealing off the airway. 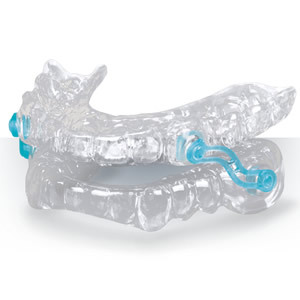 Although some adjustments may be needed over the first few days or weeks, some of our patients respond so well to oral sleep appliances that they can stop using CPAP equipment. Do you suspect that you have sleep apnoea? Do you or your sleep partner struggle with snoring? Schedule a complimentary consultation with us today to find out how we can help.